The amazing animated Japanese series Orphen is now on DVD and features the first three episodes that include The Sword of Baltanders, The Blood of August and Battle of the Dragon. 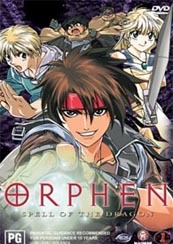 The first DVD in this series is called Orphen - Spell of the Dragon and revolves around the adventures of one of most powerful sorcerers in the world, Orphen. Banding together with his young apprentice, Majic, Cleao the spoiled little rich girl and two highly amusing and mischievous trolls, they must uncover the dark secrets behind the prestigious University of Magic and discover the mystery behind Bloody August. Probably one of the best animated Japanese series in long time, the story is set in a world that is similar to mythical medieval Europe. In unknown circumstances, Orphen fled the University of Magic and discovered that the sword of Baltanders can control the worlds most powerful and deadly dragon, the Bloody August. Breaking all laws of the university, Orphen has vowed to watch over this sword and make sure it does not fall into the wrong hands. A grand adventure that is guaranteed to take you on a magical and enchanted journey. This is one series that is a must own and features some compelling stories and characters that you will love, hate and laugh with.